Become One of 250 Smartest People Online To Wield The Power To Change Their Lives. Now, if you are a person who looks for screenshots of fake traffic stats created from either stolen images or from using fake traffic bots, then I'm sorry to disappoint you. This page is about a system that people can use to transcend from conventional methods of driving traffic to the next generation way of doing it. Today, I have a dangerously powerful system to share with you. In short, the deal I'm recommending lets you become part of an 'Elite' group of online business owners that leverage this system in an innovative way to build their business. Once you have become part of this group that has his magic box of technology, you can replicate it to work for all of your businesses. Once you start using this system, you too become the NXT Gen Blogger. The term 'Blogger' doesn't mean this system is a blogging course that can be used just by Bloggers. It is a universal system for driving traffic. Whatever form of business you have been doing online, you can boost your reach by at least 200 fold year after year after year. The technology system is a box of software tools that work in harmony to build your business day and night. Think about this for a minute: How much have you spent on products and services that you thought could improve the reach of your business(blog, company website, etc. ), only to find that your pockets were shrinking out of losing money? The worst part is that probably your business never got the attention you ever wanted. If you are not yet ready to give up on your new blog or website just because you can't get it to reach a targeted audience, then my friend, you should read on. Research by Smart Insights proved that 63% of online customers actually expect companies to offer customer service via their social media channels, and 90% of social media users have already used social media as a way to communicate with a brand or business. Social Media is the best way to acquire a targeted audience at a cheaper cost. If you can grow your social media account, then you can grow your business easily. On average, a typical Social Media Virtual Assistant would cost around $180 for 20 hours. What if you had this ability to hire that person for just a ONE TIME PAYMENT(yeah, no monthly payment) and tell that person to work to improve the reach of your website or blog on social media for every day for the next three years? You negotiate with them and get a deal of $6000 for the next three years. That sounds that like a nice deal as you just saved $480! Well, if you are excited about that, then how about a system where software tools do this job for you just like the $6000 VA. How much are you willing to pay for such a system? Since it's all software that does the work, let's make it half of the actual cost - $3000. You just saved another $3000 on building your business. What if I told you that you could save much more than that. I am willing to show you a system that can give your blog or any business website that reach provided by the $6000 VA for just under $500. Will that put a smile on your face? Wait! Let me add in something more to make that smile of your better. What if this system that I hand over to you can work for you, not 20 days but for the whole month or year for three years. I guess $500 for a system that works for you every day for the next three years is like magic. It is not only better in terms of the work efficiency, but also way better in terms of cost savings. $500 for three years would mean that the system costs you just under $14 per month. That&rsquo;s only $0.46 per day! Let me add in just a tiny bit of bonus to that &ndash; I say the system is going to work for you for the next five years costing you around $8 per month. Do the math, and you will see that it's just $0.27 per day. Let me tell you a secret about the system - "It will work for you every day of the year for much more than five years". Before I let you have this system, I would like to warn you that this system will make you lazy. However, if you are lazy to set this system up, then you are not fit to use it. If you are that person who is willing to put some effort into setting this system up by spending a few hours, then you are good to read further. Else, please leave this page as this might never be the system you ever wanted. If you are serious about taking your blog or business website to a whole new level, then I have an offer for you that you can't refuse. If you have reached the end of this page, then I am sure you are not just another lazy or unmotivated person who left this page seeing the length of the text content or maybe the $500 tag. I am sure you have that gut feeling that this is the 'Sceptre of Zeus' that you wanted to use on your blog or business website. A person like you, who is willing to put trust in your business by deciding to get this powerful system for $500, deserve to use this and for your leap of faith, I am willing to offer you this system for just $23.95. The entire system is documented in a 67 page eBook that is simple with details on how the system can be done to a blog, although it is possible for any website. PS: I may take down this offer anytime. Is there any additional investment involved? Other than one software tool to be purchased for $27, you won't need any additional investment if you are using the system to drive traffic. How much time is required to set this system up? It should take a few hours to set up everything. If you are implementing this to a brand new blog, then the blog should have at least three to five posts before using the system for it. If it is a business website, then you can drive traffic to it from day one. Due to the nature of the product, there is no refund provided. How much improvement in reach can this system do for my website? For my latest blog, after implementing the system, the audience reach has improved by an average of 214.59% per month, as of 9th March 2019. Does this involve any traffic exchange? Of course not! It is a smart system to grow your social media account, hands-free, every day, by leveraging some of the best technology tools in the market. What is the primary source of traffic? The primary source of traffic is Pinterest. Although the concepts and the entire system can be adopted for other social media platforms. I already have other courses on Pinterest. Why should I buy your system? In one sentence - Because this is going to be the last course you ever need. If you have other courses on Pinterest, then you really have to buy this. This system can be placed right on top of all the things you have learned from other courses and grow your Pinterest account fast. For example, xpesos here has an amazing WSO on Pinterest called the RMM(I am not an affiliate but a buyer who can totally recommend it). 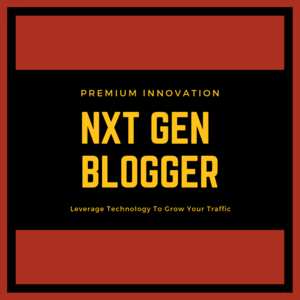 If you have been using that in your business and if you integrate NXT Gen Blogger over the top of that, then, believe me, your audience reach will grow much faster, more like a Lamborghini with rocket fuel(hmm..strange..yeah..but you get the idea, right?). NXT Gen Blogger actually puts other courses and systems on steroids! Is this WSO about creating a blog? No. It is a system to improve the reach of your blog/business to a larger audience thus improving the traffic naturally over time. I use the system on the blogs I create and that is why the report was created around a blog. This is the next generation way of improving the reach of your website day after day after day. Hence the name 'NXT Gen Blogger'. 1. Basic computer skills like typing on the keyboard and clicking mouse. 2. Internet 3. Computer(Of course!) 4. Willingness to learn and implement 5. The desire to be lazy and outsource work to software tools. 6. Burning desire to grow an audience for your business. Your 'system' is vague. What if I have been using a similar system to grow my Pinterest? Here is what the system can do: It can grow your Pinterest account naturally and automatically. It doesn't just post scheduled pins. With a one-time setup, multiple boards in your Pinterest account will have regular engaging content that can actually grow your audience every day. If the current system you use can do such a thing like having multiple boards in your Pinterest account to have engaging pins added every day hands-free, then you don't have to buy this. Why should I buy this system? This is a system that I created for my own purpose. Even when writing the report and creating this WSO, there were moments I thought "Should I really release this system? Shouldn't I just keep using this system to build other businesses using this?". I believe the system is being sold for a much lower value than it actually has or provides and that made me decide to give this system to only a maximum of 250 people in the world, who are really desperate and serious about growing their business. I decided that I should release this at a price that most people can afford since only if we share our knowledge, will we really grow as an individual. Stashing away a system just because it is too good is only selfish. The World Wide Web(WWW) is 30 years old. If Tim Berners Lee decided to stash away the WWW, the internet would have never been what it is today. The Internet is my greatest teacher. Does the purchase include any software? No. But to implement the system, software tools are needed. Only one of this tool is required to be purchased(around $27) whereas the others are free.